Like many people with a kindle (I suspect), I download a lot of free books. I hate to say it, but many of them just don't do it for me. For reasons such as downloading something that isn't really the genre I read, to just plain bad books, a lot of what I read I end up discarded after a few chapters. With the invention of e-readers, the term 'disposable fiction' has never been more apt. However, occasionally something catches me by surprise. After dragging myself through the book of a fairly well-known author, I picked up Cure. Several hours later I was halfway through and had to force myself to put down my kindle in order to get some sleep! "Cure" tells the story of a crazy doctor who has discovered a zombie virus and decided that in order to heal all sort of diseases, such as cancer, he is going to create a zombie-human half breed by kidnapping and impregnating them with zombie genes. This is a multi-character filled cast, from the people working in the hospital, to the poor women who have been kidnapped, to the family of those women. At times it was hard to keep track of who was who, but that was also because the book was so fast moving. It was pretty horrific in places, so this isn't for the faint of heart, but it certainly kept me turning the pages to find out what was going to happen next! I give Cure four out of five stars. The only reason it didn't get five were perhaps a couple too many points of view to keep track of, and a little too much gore (I did have to hold down my dinner on a number of occasions, though this is only testimony to Belinda's vivid power of description). Overall this is a must read for all zombie fans, with a new fresh setting and idea in what is an over saturated zombie market. Here is the blurb and a bit about the author. You can buy "Cure" from Amazon.com and Amazon.co.uk. A thriller hailed as "original" among zombie fiction readers and enjoyed by those who aren't such fans of the genre. Includes "Payback", a BONUS Strandville Zombie Series Short. When those closest to you break your trust, the only option is payback. Six months before an outbreak of viral plague turned the residents of Strandville into a mob of flesh-hungry undead, Max Reid was a new father struggling to overcome a gambling addiction for the sake of his family. Desperate to keep his secret, out of work, and on the losing end of a debt large enough to get him killed, Max turned to Mitch, a Nixon Center guard and the closest thing he had to a friend, to make the money he needed to break-even. What he didn't know was why Mitch was so eager to help him or how far he'd have to go for the cash. Max Reid is about to find out a terrible secret that will change his life and push him to destroy others'. Belinda Frisch's fiction has appeared in Shroud Magazine, Dabblestone Horror, and Tales of Zombie War. She is an honorable mention winner in the Writer's Digest 76th Annual Writing Competition and her novel, CURE, is the runner-up in the General Fiction category of the 2012 Halloween Book Festival. 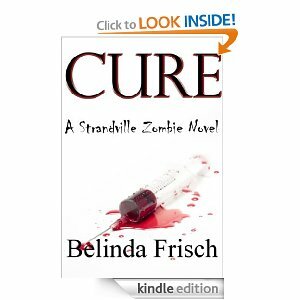 She is the author of DEAD SPELL, PAYBACK, and CURE, the first in the Strandville Zombie Series which has recently been optioned for film. Hi, M. How have you been? Thanks for sharing. I have this book on my Kindle, and have had Belinda on my radar for some time. I just don't read that many zombie stories because vampires kick their asses every time. Right? *grins* Just kidding. In all seriousness, I don't care for the subgenre that much. On the other hand, I have been reading Stant Litore's Zombie Bible series and have been incredibly impressed. I'll get to this one real soon. Take care of yourself and continued success, my friend.